This coming Monday night, I have been invited to join Sean Connors‘ preservice teachers at the University of Arkansas through a conversation on Google Hangouts. They created a very smart list of questions for me, and in order to maximize our time, I’ve written this brief response with lots of links, some of which we can explore together or, more likely, students can review on their own after our chat. First, I want to thank you for asking such smart, challenging questions. You are all clearly thinking deeply about what it means to be literate, what it means to teach literacy in modern American schools, both rich and poor, and how to balance your own relationship with technology in light of what you want and need to accomplish with students. This is the kind of thinking that all teachers should be doing. Thanks for starting your journey as teachers with this mindset. Second, as you have likely figured out, there are no easy answers with technology and education. Even in the cases where a school has all the tech it could want, teachers still struggle with these questions. And, of course, they struggle even more when they don’t have the tech. So, I want to address that big question. There are no perfect solutions, but both Dr. Turner and I have spent lots of time in lots of schools and we can tell you that teachers get creative in order to get the technology they need. We have seen them use Donors Choose, or other similar sites, to ask for technology one bit at a time. We are seeing them work with local businesses to get old computers and tech through programs like InterConnections. Finally, we see teachers encouraging parents to get connects through programs like Everyone’s On. Again, no perfect solution here, but just as we would advocate to have books in our students’ hands, we need to advocate for technology, too. This leads to a third theme that came out in your questions — is it our place, as English teachers living in a Common Core world — to teach digital reading and writing along with more traditional academic literacies? You will, undoubtedly, not be surprised by my answer: yes. This is not an either/or situation where technology competes against learning how to write an argument essay. It is a both/and. We teach students about making meaning in both alphabetic text, using words, sentences, and paragraphs while, at the same time, discussing the ways that students can construct arguments with images, videos, and sound. 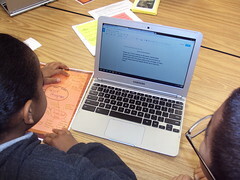 By working in tandem, we help students make connections and develop all aspects of their literacy learning. Now, on to some specific questions and what we can talk about tonight. I’ve tried to honor the spirit of all your questions here, some of which have been summarized or condensed for time and clarity. Basically, I am sharing a list of links here, and we will talk about them in more detail. Starting with the question about being a middle school teacher and getting involved with the National Writing Project. How can you continue to grow as writers, especially as digital writers? What happen when we do not do this kind of work with technology in our teacher prep programs? Why are teachers afraid? How can we become digital literacy leaders? Is it our responsibility, as educators, to engage in social media? In what ways can you discuss what it means to be literate so that others in our school/district will be more open to the idea of teaching digital literacy? Is all literacy about conversation? Where do we strike the balance between technology as a crutch (spelling and grammar, for instance)? Content completion/coverage vs depth — again, where is the balance? Technology just being a “tool” — who decides? We do. My stance is that we need to actively resist technological determinism. Have we fallen into a trap with technology? Do we prefer it? Yes, technology has affordances, but what are the constraints that we should be aware of as well? How do we get beyond the “cool” factor and use technology in ways that are meaningful? How do we help steer students toward more positive aspects of online learning and away from parts of the Internet that are, of course, not good? How can we foster discourse among students across schools? How can we create projects that allow for student choice and building digital projects over time? What are some examples of practical steps both Access and Exodus could take to address their respective problems? How to teach digital literacy in a low income school? Anything else that we should add to this list?